I have one and a half bathrooms in my one-story house. Both bathrooms get regular/frequent use. When I clean, I get them both done at once. I did not include the shower because personally, it is my least favorite thing to clean in the whole house and I do it on a different day. I also did not include the floors. I mop all the linoleum in the house on the same day. This works well for two bathrooms on the same floor, because you will be running back and forth between the two. This is because the disinfectant takes a few minutes to really work. Here are the steps I follow. Put toilet cleaner in toilet bowl #1, swish around with brush, let sit. Liberally spray toilet #1 with all-purpose cleaner. Repeat for toilet #2. Wipe down toilet #1. Use as many rags as you feel necessary – I use 2-3. Using new rags, repeat for toilet #2. Liberally spray all parts of toilet #1 (including in the bowl) with disinfectant. Let sit. Repeat for toilet #2. As the bowl cleaner and disinfectant sits, move on to sink #1. Clear off sink #1. Liberally spray all-purpose cleaner on sink #1. Repeat for sink #2. Wipe down sink #1. Wipe down sink #2. Liberally spray disinfectant on sink #1. Let sit. Repeat for sink #2. Spray and wipe down mirror #1. Repeat for mirror #2. Wipe down toilet #1. Again, I use 2-3 rags just to be on the clean side. Scrub toilet #1 bowl with brush and flush when finished. Wipe down toilet #2. Scrub bowl #2 and flush when finished. 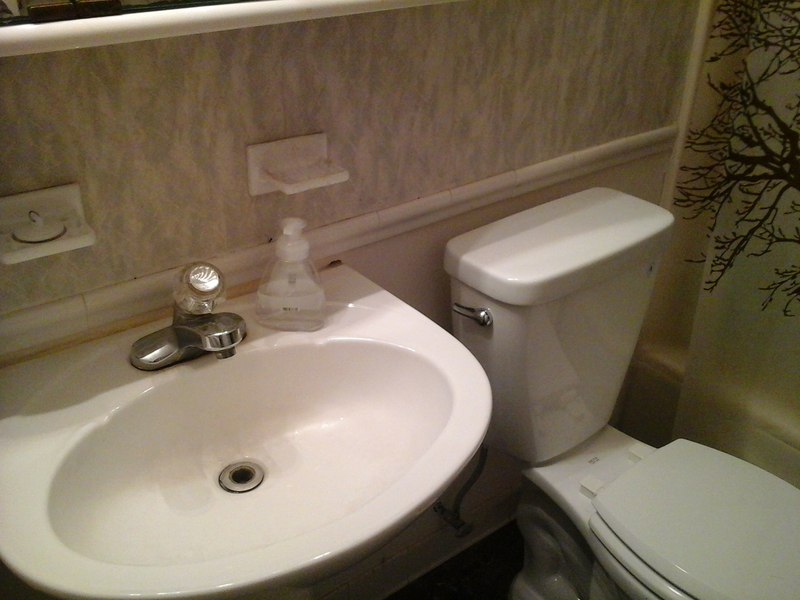 Wet new rags and wipe down/rinse sink #1. Technically, you should rinse the disinfectant like this – I don’t for the toilets because I don’t want to use a towel to dry the toilets. Use a towel to dry sink #1. YOU ARE FINISHED! Enjoy your shiny, clean and disinfected bathrooms! Let toilet bowl cleaner drip dry into toilet before putting it back in its container. Do this by placing it between the toilet seat and the rim, with the brush part over the bowl. Wipe your mirrors in an S-like pattern, starting at the top and working your way to the bottom, for no streaks. Clean your toilet in an order that makes sense to you so you don’t wipe rim/seat germs back onto the handle, etc. For example: Rag #1 wipes (in this order): top of tank, sides & front of tank, handle. Rag #2: Outside of lid, inside of lid, top of seat. Rag #3: underside of seat and rim. Always shut the toilet lid before flushing to prevent floating water/particles from spraying on your walls… or toothbrushes… etc. It is known that the spray can reach 6 feet. Don’t forget to wipe down any toothbrush holders, soap dispensers, etc that reside on the sink. Clean and disinfect that stuff too! How often do you clean your bathrooms? Do you have a routine?